Why Kattappa killed Baahubali was one of the most talked about things in Indian Cinema this year. With a track record of 12 tickets sold every second for Baahubali 2 The Conclusion, this was a major achievement in itself! On that note, it is such a proud moment when you get to know that the crew that worked on the sound of a massive blockbuster film like this consists of friends you have known for years. This makes it all the more amazing when they are very willing to share the techniques and methods they used while designing the sounds for this epic film. 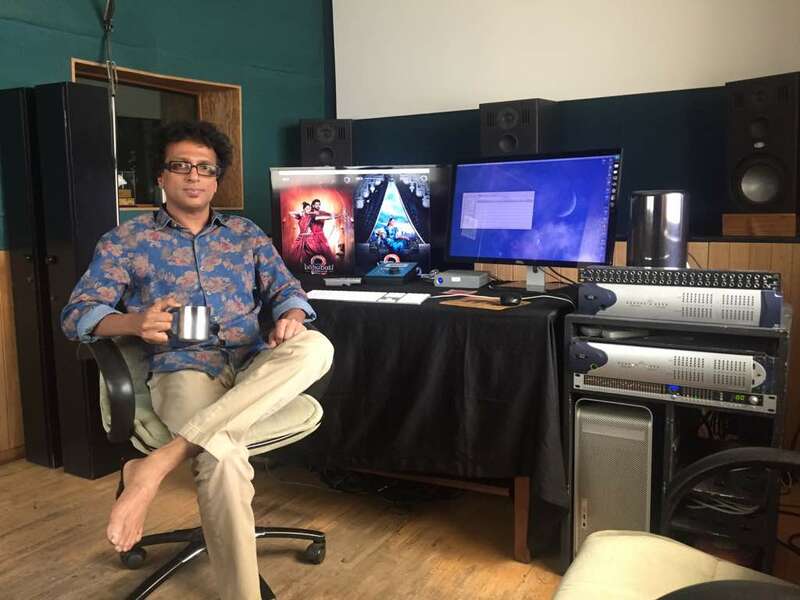 P.M. Satheesh, who owns Fireflys Post Sound in Mumbai, the place where the entire sound design and sound edit was done with a team of just 4, was really open and forthcoming in this conversation I had with him. This was from a perspective of an audio person talking about his craft and revealing all the techniques and tricks that were done in the sound of the film. Studio Admin: Vimal Kumar T.K. The next words are from P.M. Satheesh from a conversation we had, regarding the sound design and how he approached the movie. Baahubali 2 was bigger and grander for my team and me because we had an amazing beginning and we had to have an even bigger conclusion. The sound design was done over a period of 7 months at 15 hours a day initially and moving on to 20 hours a day in the last 3 months. That may sound like a lot of time, but trust me, when you have just 4 people in your team, working on 14 reels (the edit was done to 10 minutes reels unlike the traditional 20 minute ones), you only get 15 days per reel, and that is including all the sound design, dialogue editing, foley editing, and 4 languages, not leaving a single frame that was not justified by us!! Not to mention the constant changes in Visual Effects, and edits. It’s a mammoth task and too little time. The last 30 days were just 2 hours of sleep a day and the last week was practically falling asleep where we sat and when we have more than 2 blinks in a go! But my team was such a wonderful one. 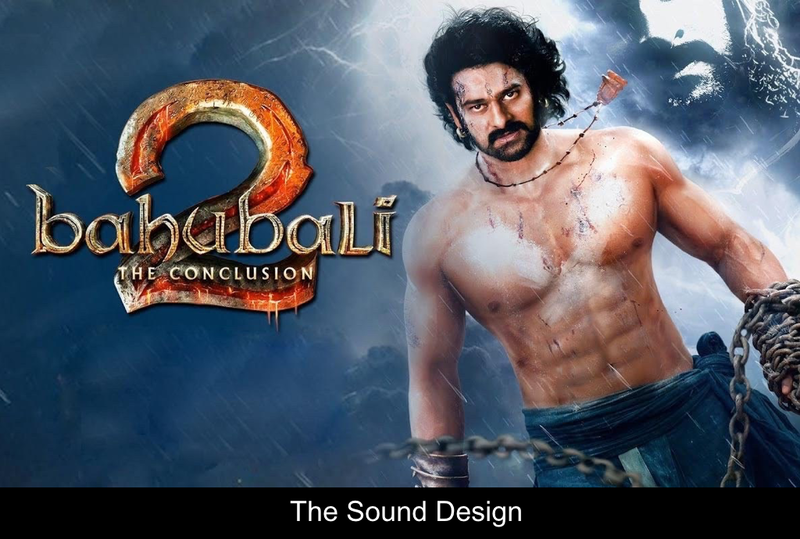 Manoj M. Goswami who did the sound edit and co-sound design has pulled off an amazing job. We have such a great team coordination and thought process. This helps us to keep the focus on the vision the director has and execute that through the world of sound. We don’t look at ourselves as 2 sound designers. We look at this as a team. I also do, apart from main design, Foley, all fx recording and supervising the mix. We have a really great tuning. What he thinks and what I think are exactly the same. I sit with Manoj and we discuss elaborately how the design of a reel should be before he starts. Post this, I sit with two other editors to look at the foley edit and Dialogue edit, as Manoj works separately as per the brief. Once he completes sequences in the film we see it and do course corrections. Once he does his initial round of the reel, then I sit with him and do an elaborate session from beginning to end putting up the reel. By now what other editors have created under my supervision is also added to the reel. Once we design we don’t segregate anything. It’s entirely attained together after a preliminary round. Once we finalise the reels from our end, we show it to the director. If the director has different ideas or corrections, we then get to work on that. But because we had done Part 1, for Part 2 we had a really good understanding of what the Director had in mind. Now, we being in Mumbai and the rest of the team in Hyderabad, we managed the initial designs and reviews in Mumbai. Once we got the flow, we decided we would work more in Mumbai and then take the reels to Hyderabad for review. I would go or Manoj would go with me, along with our sound library so we can do any changes that were needed there itself. It did become very tight scheduled in the end due to the constant changes, but we put that extra effort and managed to pull that off. When we play the sounds to the director, we remove the score even if it’s a temp one. The reason is that sound should stand on its own. The score may be muted or edited sometimes. If we design and edit with that gap and the director decides to remove the score, we have to go to work again and that’s not really feasible in towards the end of the mix. These decisions are always done at the mix stage and so we keep all the options we have till the very end. This helps us to be more focused. But of course, that also means that some of the hard work on the design will sometimes have to be sacrificed for the score. This is something that I have come to accept, although painfully! If you notice, Part 2 had much lesser winds in the design and ambience compared to Part 1. The reason is that when we went to the mix, we realised that the score had a lot of clash with the winds and tonal sounds we designed for scenes. This meant that we did a lot of work to get it removed at the end stage. This was a big thing for us to understand. This also helped us focus our design to a different direction in Part 2 on giving it the space for the score. It was the same with the Bull Running Sequence. Bulls are very difficult to record and use. They are difficult because if you create, for some reason, it sounds like a horse. You can’t use similar sounds. This was our biggest challenge. We got hoofs of bulls from butcher shops to record, but they were not very convincing. The audience needs to associate with this. I had an inspiration, In Jungle Book, there is a sequence of bisons running. They used wooden logs banging on the floor. This was used as a pattern that was satisfying for the weight of the bison. I told Manoj that this is what they have done and we need to take this concept and do something different. So we asked the foley team and recorded a tonne of sounds in multiple takes with logs on sand, stone, layers of sound, got it to fireflys and added a lot of bass to this. The pebbles and rocks were then added to this. We had different hoof recordings that were harsh, mellow, hard, bass etc. They were layered based on the shots. So, for example, the sequence where Baahubali rises between the bulls we had the bass hoofs and when the others are getting trampled, we had harsher hoofs etc. This gave us a very believable sequence of the bulls. In spite of this, we kept working and tweaking this till the last day of the mix! The same is with the sound of the Turmeric falling on the elephant. That is not Turmeric in sound! It is extremely fine sticky sand in bulk that is dried. We filled it in sacks and poured it from a height. And we did multiple takes and layered. We poured it on different surfaces like Cloth, tree trunk, cloth on mud, etc. Getting powdery sand is not easy. And moreover, the speed of release of this from the sack is very important for the weight. It has to be done precisely. We then layered additional sound for the body of the sound where the turmeric hits the elephant. This was done from foley and design helped to blend and sell the sound. Jewellery was another thing that played a lot of importance in this. We had our foley artist Shankar Singh shop for jewellery. The reason is there is no point in getting Jewellery that looks like the one in the film. It has to sound like it. So, we had him taking and painstakingly listening to the different sounds of the jewellery before buying it. Once this was recorded, this would add to the realism of the scenes. The coronation sequence was the most memorable one for me. This took a lot of effort and time to get things done correctly and perfectly. The reason is, when you see this, you will see power, ego, strength in numbers and command. We had to be able to convey that through the sounds. Similarly, the statue sounds were something we had to create. This was quite challenging to record because iron, when dropped, won’t give the weight needed. Plus, if one drops the iron on concrete, it may crack the floor, and have an additional ring and reflections that we would get. Then to add to this, the overtones that are generated would be very difficult to control in comparison with the score. What we did get was access to Ramoji Film City’s huge warehouse and access to blacksmiths. We carefully selected Brass and Bronze pieces. We dropped them on rocks that were covered in Sand and recorded on multiple microphones. This gave the sound of the Redstone that is shown and also the weight and ring. But once it is recorded, the job didn’t end there. We had to EQ, and Pitch shift it to match the weight and score. This took a lot of effort to do and in the end; we had a very believable sound that the director loved too. The biggest thing in the film I think was the question of Why Kattappa Killed Baahubali. I know that everyone was very anxious and excited about that scene. But that was not the pressure for us. Truth is, we didn’t get that footage until February!! It was 10 minutes of a scene that we got then. Kattappa killing Baahubali was an event that happened in the first part and is shown again. The question is not how it is why. That is the event the audience wanted to know and what we were focused on. The before and after were the ones that took the time to make perfect just because it was very intimate and had a lot of detailing from the right footsteps to the accurate ringing of the swords. This was the moment the audience was waiting for and needed a great deal of attention from us. This scene was never just foley or effects. It was a blend of both because either one on its own was never convincing. It’s the layering that takes time because we needed to choose the right sound that stayed with the right effect to give the right emotion. Else, it would never work and Manoj who pulled off a fabulous job did this scene. Another example is one of the layers of arrows you hear in the movie is actually done by National Archery champions, just because of the fact that when they release a bow, the sheer determination and power of the arrow flying by is not possible to attain if untrained people did it. Dolby Atmos and the latest version of Pro Tools (12.7.1) was what we were working on. Atmos really gave the complete immersive feeling to the cinema. We had the overheads and played with them especially with the Rain of Arrows or the overhead reflections. It was such a joy to be able to design and hear it like that. But in honesty, I felt we needed more time for Atmos. It was not because of the format, but because it opens up so many ideas and possibilities. And as I said before, at 15 days a reel, that was very difficult. Yet, our team did the best and gave a great sounding movie. Occasionally we had loud sequences, but that was something unavoidable. We have the constant fight with the theatres where they refuse to play at the levels we mix at. And in this case, we had come face to face with that issue during one of the test viewings. Culturally, people in this part liked distortion for loudness. This was something I could never accept. This caused us to push some sequences louder. But we did take care to remove the annoying frequencies in the mix by Debajit. We wanted to make it loud, but not annoying and I think we managed to get that done. In the end, I would say that hard work, sleeplessness, zonked out states and constant self-motivation has paid out and how. Our team is so happy to receive the reviews from our Peers and also friends. At the end of the day, it’s the cinema that everyone has to enjoy, and we made sure we put our 100 percent into making it so! Having an amazing Studio Administrator, Vimal Kumar, made all of our coordination and activities much smoother. Thanks a lot Satheesh for those wonderful words! It indeed is such a success beyond any Indian Film has done! And everyone reading this, please make sure you watch the movie in the theatres. There is a lot of hard work and pain that has gone into this, so, don’t spoil the experience for yourself. Thanks a lot! Unfortunately no. Thats how it seems to be set up.